"Today we are introducing Opera 52 beta. We are happy to announce, that this build comes with an improved ad blocker, which lets you load pages faster than on Opera 51, or Google Chrome. We are also introducing a new, convenient way to select, and copy multiple page addresses at once, and some very cool error pages animations. Almost two years ago, we introduced the first built-in ad blocker into our browsers. Since then, we have stayed committed to bringing you the fastest, safest, and most interruption-free browsing experience. Our ad blocker is also used to provide safety features, including protection against cryptojacking attacks, which we introduced in January 2018. This time, we are focusing on browsing speed. The performance gain in our ad blocking mechanism was possible due to an improvement in the string matching algorithm. In order to check how much faster Opera 52 is, we performed some tests. Our benchmark tests were conducted on 15 popular news websites, which were tested in ten iterations each. 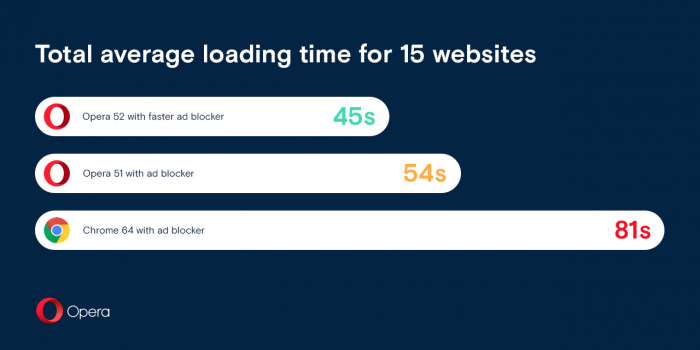 The results show, that Opera 52 performed 16 percent faster than Opera 51, and 44 percent faster than Chrome 64 with its newly introduced ad blocker. You can read more about how Chrome, and Opera ad blockers compared in our benchmark tests here. Ever wished to be able to perform actions on multiple tabs at once? Well, now you can. With Opera 52, selecting multiple, individual tabs can be done by holding down Ctrl (⌘ on macOS), and clicking on the tabs. You can also select a range of tabs from left to right by holding down the Shift key, and clicking on a tab. You are now able to run the same commands with multiple tabs selected as you did with a single tab, including: reload, duplicate, pin, close, mute, or save to Speed Dial. We think this improvement to tab manipulation will prove to be very useful. Now, for example you’re able to close only selected tabs, or open the context menu to perform additional actions. A new function found in the context menu called “Copy page address(es)” copies the addresses of your selected websites to your clipboard. This becomes really useful, when you want to send a bunch of pages to your friends. 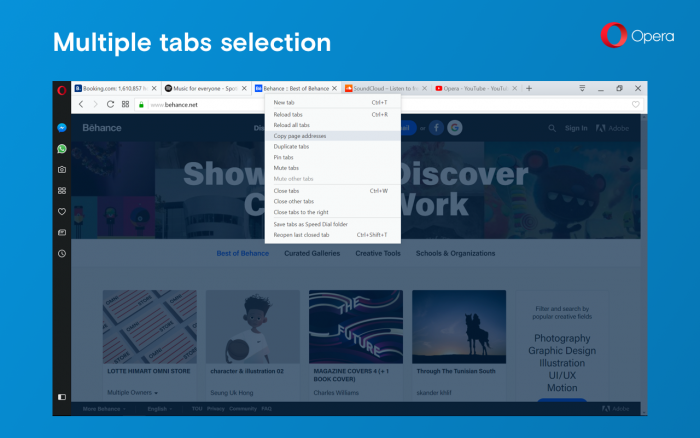 Moreover, rather than saving your entire current browsing session for a future session, you can now pick, and choose particular tabs you wish to store for later in a Speed Dial folder. Note, that you can close a tab by holding alt, and clicking it. Previously, you would use the Shift key, plus a click to close a tab. Error pages tend to raise our blood pressure. Who wouldn’t be upset by a DNS error, right? We decided to make this experience a tad more pleasant by introducing some cool animations. Check them out: Network access denied, Internet disconnected, Site can’t be reached, DNS errors, Fraud and Malware warning". The Chromium is updated to version 65.0.3325.52. Those extra tab manipulation features are great. But the opening of new SD tabs became choppy and hard. The animation is not fluid and there is some white flashing, even with no wallpaper at all, which was not present in O51 beta. The animations in general became very choppy, being it Bookmarks, Easy Setup,etc, the feel of the browser is just heavier. I'm forced to go to Opera 51 stable. "Click the tab to scroll" is Very Bad Idea, please remove this feature. you can creat new button like "Downloads" button or "Add to Bookmarks" Button instead. i have very problems with this. please support CTRL and SHIFT buttons on History page to select multiple URLs for delete them. and "Clear All Shown" after search custom URL on History page. @viewer2012 And why it's a bad idea? @viewer2012 It's a good idea, you can suggest it in the 'suggestions and feature requests' area of the forum. @leocg i tried this from very older opera' versions. but many of them Deleted on new forum. but you can find my Suggestion from opera 43, 45, 46, 49.
but i did not anything from opera. The new OP 52 (Beta) is a fine implementation of the browser. Works perfectly for all of my web surfing needs. Extremely fast and stable. I am thinking of using this OP beta as my default browser in Win 10. Hope you release this version as "Stable" soon. Thanks for producing such a good version of OP. @leocg i need close menus sometimes .so i click on the tab for this. but with this future, I have to search the whole article to go back to the previous position. @0perafanatic Examples of pages where it isn't working? Only issue I've run across is the site https://www.filmstruck.com/us/ completely locks up the tab when trying to load. Can't click, scroll, anything. Just have to close the tab. Same issue with Opera Developer also. Works fine in Opera Stable. Also works fine in Firefox, Edge, and Google Chrome. Same extensions running in all versions of Opera. - Issue, when moving bookmarks on Linux (thanks andrew84 for pointing this out). - Crash on Linux, while saving a web page as a PDF (thanks x a, Let’s talk, and others for your comments). - Speed Dial extensions are fixed now." The Chromium has been updated to version 65.0.3325.88. Speed Dial custom thumbnails are broken, I can't set them, they just don't appear. It's working on Stable though. - New translations are integrated. - Fix for macOS users with TouchBar (opening new tabs won’t be slow anymore, when a text field is focused). - Spinner, and mute icons have been properly scaled for DPI > 225%." The Chromium has been updated to version 65.0.3325.146. Nice release. Please designate OP 52 as "stable" soon. Thanks for your continuing development efforts with OP. "We’ve decided to prepare one more build, before we release Opera 52. You’ll find a new Chromium version, 65.0.3325.162, as well as some layout, and user interface fixes."